Saturday morning I sneaked in some 'me' time with my usual cup of green tea, a sweet treat and this lovely book. It was a brilliantly sunny day today and from my sofa I saw the world go by as I listened to Ravel's Bolero yet another time and caught up on my reading. It felt so good to be relaxing so, with no fixed agenda for the day. 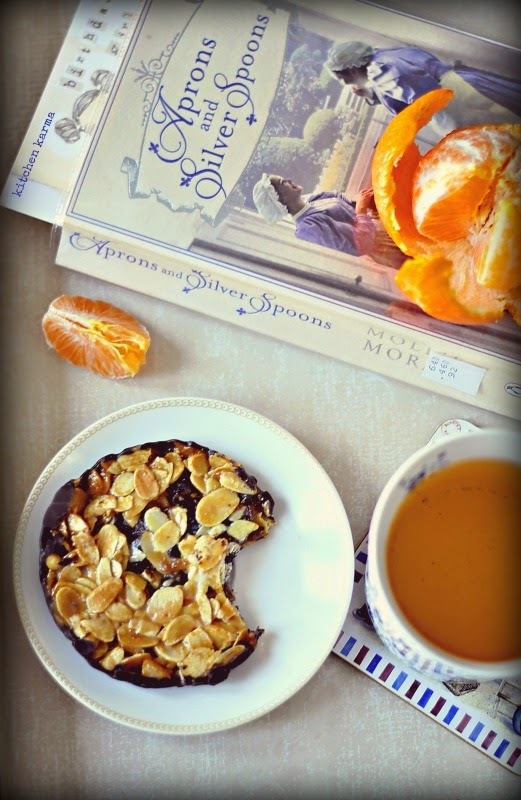 The book 'Aprons and Silver Spoons' is a heartwarming memoir written by Mollie Moran who started her professional life as a scullery maid in the 1930s. Mollie writes simply yet beautifully and the book is not only packed with lots of interesting experiences of Mollie's life, she has weaved in the social, political and cultural changes that were happening around that time. This fascinating book also offers many interesting recipes and tips from the kitchens of 1930s England. Hope you enjoyed my photo of day eleven. Suchi , what camera are you using ? Do you sometimes use phone camera ?